Russia Pictorials Stamp Packet, 100 different stamps from Russia. Visit Russia tonight! 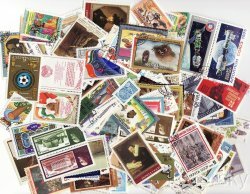 This is an excellent stamp packet mixture of 100 different Pictorial Stamps from Russia. The stamps of Russia reflect the Russian art, customs, history, and people.